As a songwriter, he created some great hits for The Kingsmen, Etta James, Louis Prima, The Sonics, and many others. As a singer, often singing bass and tenor in the same song, he inspired many to emulate his style, including Barry White, who performed an incredible version of “LOUIE LOUIE” on his BEWARE album. He is listed as one of Frank Zappa‘s inspirations on the ground-breaking FREAK OUT debut album by the Mothers of Invention. He is one of the great underdogs in the American music story. He is Richard Berry, and he deserves your attention. Richard Berry was born on April 11, 1935 in Extension, Louisiana. When he was one year old, he was brought to Los Angeles, where he lived most of his life. As a child, he had an injury to his hips, and used crutches until the age of six, when he had corrective surgery. His first musical venture was the ukulele, which he learned at a summer camp for crippled children. The original “LOUIE LOUIE” was written in 1955 by Richard Berry and released as a single in 1957 on Flip Records. 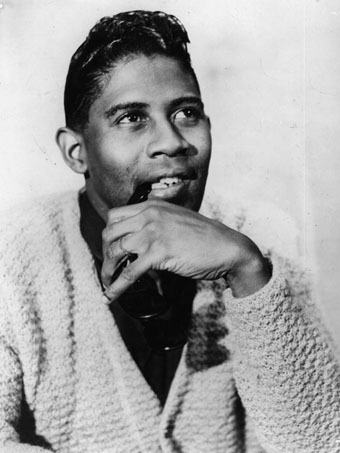 Recorded with the Pharaohs, Richard created a catchy, somewhat calypso diddy that was originally intended as the B-side for his recording of “You Are My Sunshine.” At the time that Richard Berry released “LOUIE LOUIE,” he was ready to expand his musical horizons from his doo-wop musical roots. As a founding member of the Flairs, he had various degrees of success with his recordings on Modern Records. When he was offered the opportunity to record on Flip Records, he was trying out a new sound, playing with a local Latin rhythm and blues band known as (Rick Rillera &) The Rhythm Rockers. Inspired by certain Latin rhythms, Berry wrote his creation on a napkin backstage between musical sets, and waited a year before recording the song that would eventually become the world’s greatest party song. With the help of an organization by the name of Artists Rights Enforcement, Richard Berry was able to recover some of his publishing rights in 1986. In 1992, “LOUIE LOUIE” was sold to Windswept Pacific, a publishing company based in Beverly Hills, and Richard Berry received a substantial payment. In 1983, he traveled to KFJC, a college radio station based in Los Altos Hills, California, where a marathon took place to celebrate the massive impact of this song. Titled “Maximum Louie Louie,” this event marked the first time Richard Berry had ever met any member of the Kingsmen, as Jack Ely, the original vocalist, flew down from Oregon for this special occasion. Heavily promoted by a very ambitious all-volunteer staff, this event was covered by national and international media, and lasted for 63 hours, with over 800 different versions of the song. Prior to this particular event, Richard Berry received very little acknowledgment for his musical legacy. Soon afterwards, he was bombarded with requests for interviews, and performances around the country. As Richard received recognition as an internationally renown musician, financially successful after many years of struggling in the music circuit, he continued to live in his old neighborhood of South Central Los Angeles, working within his community to make it a better place. He continued to perform shows around the country, but had cut back considerably after a heart aneurysm operation in December 1994. 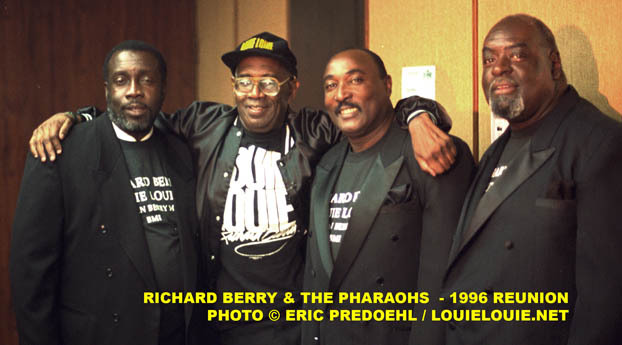 For the first time in over thirty-five years, Richard Berry got together with his old band-mates The Pharaohs for a special benefit that also featured another one of his back-up bands, The Dreamers. The event was a benefit performance for the Doo Wop Society of Southern California, and took place on February 24, 1996 at the Petroleum Club in Long Beach. Richard Berry left this world on January 23, 1997. He died in his sleep at his home in Los Angeles. The Richard Berry Discography can be downloaded as an Acrobat file. In the year 2000, Ace Records of London was able to purchase the assets of Flip Records, thanks in part to my research efforts. Previously, Ace Records had already made some arrangements to release music from the Modern/Flair/RPM catalog owned by the Bihari brothers. It’s been a real honor to involved with a company that shares a passion for the music of Richard Berry. This material was assembled by ERIC PREDOEHL with the help of articles within Goldmine, Record Collector, and the supportive words of the man himself, Mr. RICHARD BERRY. All rights reserved. Eric Predoehl is currently producing a documentary on the song LOUIE LOUIE, and the man who wrote, Mr. Richard Berry.